Well after a lazy week in Vathy much of which was spent drinking Pimm's and watching Wimbledon (didn't he do well...) we set about doing a few jobs. We now have two new domestic batteries, which Yannis here at Odyseas Marina ordered and they arrived on the afternoon ferry, just yards from Pipit - all very convenient, if not a little heavy at 36kg each. We can now confirm that our dog ramp - sorry passerelle - can take the weight of the two of us plus a 36kg battery! 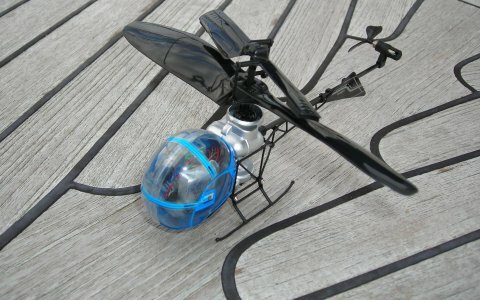 It was a relatively quick & easy if heavy job to change the batteries, and still very hot work even at 8am! 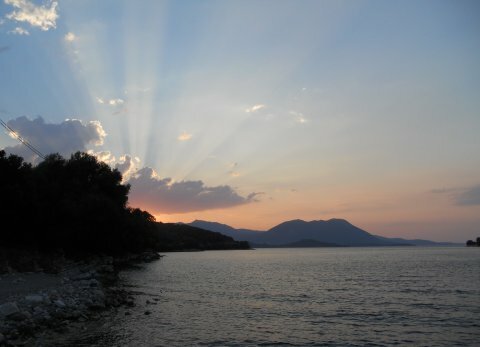 We took the fast ferry to Lefkada early one morning to try to get a tax number and failed - again - meaning we couldn't get an internet dongle contract. 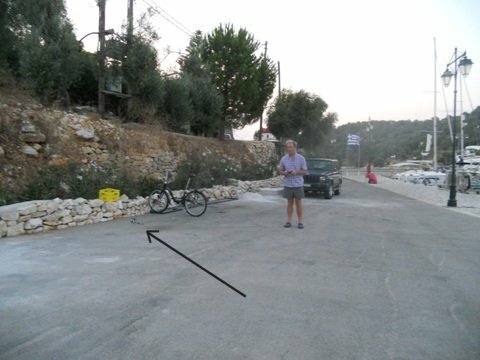 However, having spoken to an accountant in Athens, contrary to what we've read on YBW and other forums, at this stage that's probably A Good Thing - We were told that having a tax number (AFM) in theory creates some tax liabilities and you are obliged to file tax returns. So having a PAYG dongle seems a small price to pay for avoiding that complication, especially as our home marina, where we now have an annual berth, has WiFi and our probable winter villa will have an internet connection and wireless router, so we won't need to use a dongle for a whole year anyway. Ann bought a handbag, and we went to the Carrefour in Lefkada which is well stocked and quite cheap, so all was not lost. We have now viewed 3 villas in Vathy and although all have various merits, we have now decided on one for the winter. 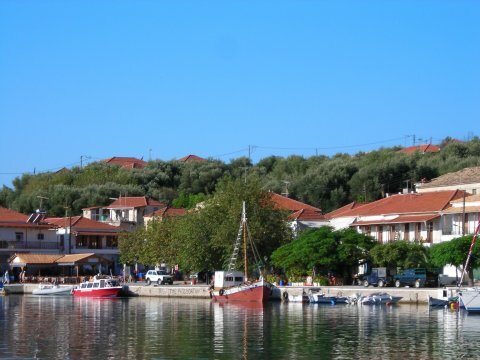 It overlooks the harbour, Pipit is about 3 minutes walk away, the super (well mini) markets, bakery, tavernas (some of which stay open in the winter) etc are right on the doorstep and it has an open fire and the all important dishwasher! So after 3 years have we sold out as liveaboards? 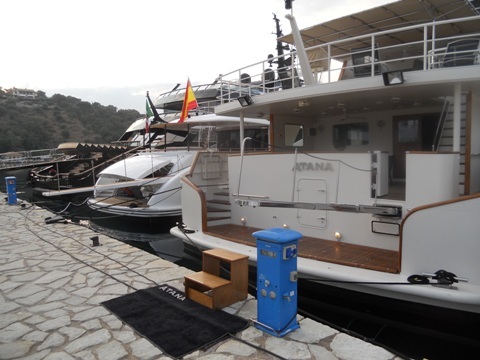 Some may think so but, for about the same price as our annual berth in Plymouth, we can have an annual berth here and a villa for the winter - not a bad arrangement we think. We enjoy what time we spend in Vathy. We had a very nice dinner out at the Italian restaurant with Barry and Trish, a British couple who have built a stunning villa as their own home here and others on the island, as well as a smaller but equally stunning holiday rental villa, and have given us lots of useful information about living here. We had another meal out with Rebecca, who has also been a great help since we first contacted her when she worked for the marina. 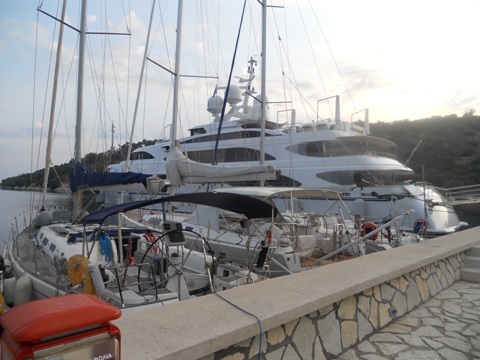 Odyseas Marina in Vathy is also one of the few places capable of mooring numerous huge superyachts, so we often have some very impressive neighbours. 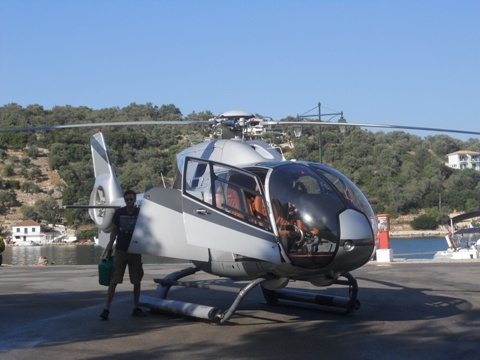 Most seem to have staff aboard and one even had their own chopper, although even their foredeck wasn't big enough to land it on, so they had to land it by the ferry slipway next to the marina building! 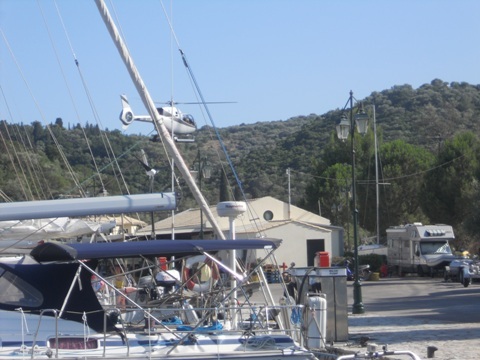 Private helicopter landing at Odyseas Marina. 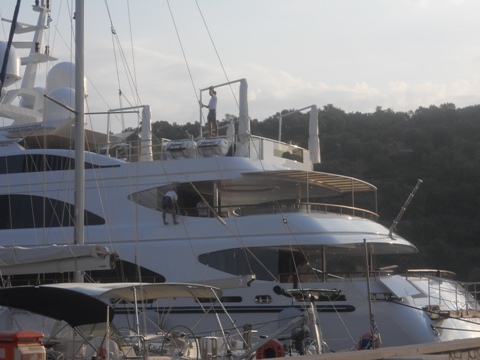 There are often several superyachts in at the same time, attracting a steady stream of admirers. 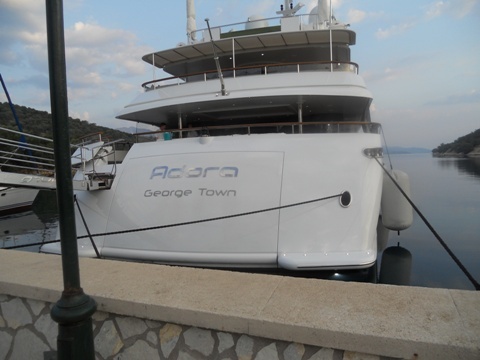 We think Adora has recently broken the record at Odyseas for the largest visiting yacht. One of Adora's crew in a harness zipping along the track to clean the windows in the morning, another cleaning the enormous sun umbrella supports on the top deck. 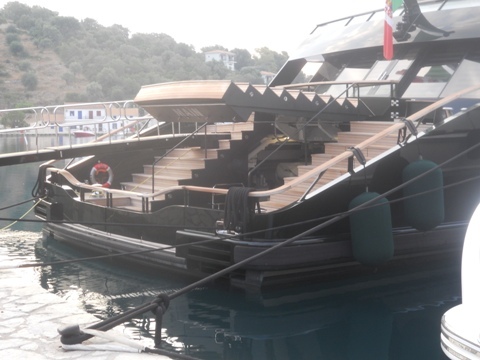 Teak steps on the stern of Main lift to reveal the toy room and machine room. And Pipit squeezed in between two of the 'smaller' regular neighbours. So last Wednesday, we finally left home again! 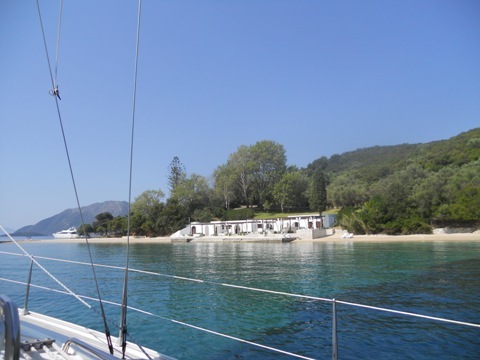 We motored the 5 or so miles to Vliho Bay where we met up with Neil & Di of Sail Ionian, from whom we used to charter, for a few beers and later we had a very good value meal at the water's edge a little way along the road from Vliho Quay. 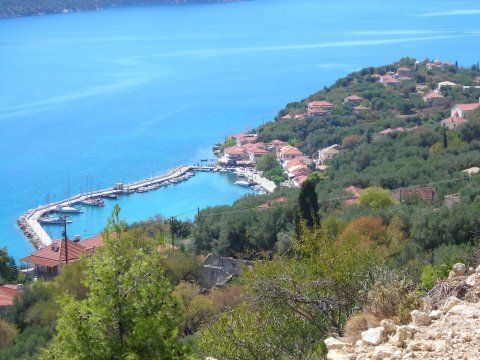 The next day we made another short hop to Skorpios Island, where we hadn't been before. The water was crystal clear, but the bay was busy during the day with tripper boats, charter boats and small hired motor boats. 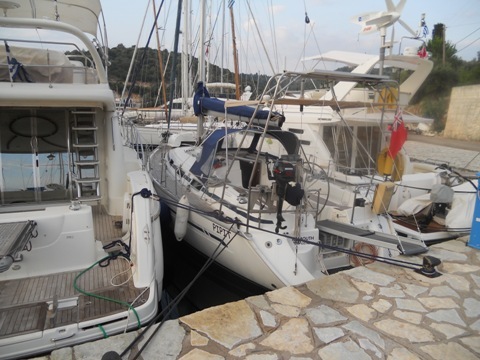 It was much quieter overnight with only a few liveaboards and charter boats remaining. However it seems we arrived here a little too late - it's just been sold. The next day we made another short trip (can you notice a theme here?) to Abelike Bay, somewhere else we've not previously visited, and enjoyed another peaceful night at anchor. On Monday we had a lovely gentle sail around the south of Kalamos to the comparative tranquillity of Port Atheni, where we anchored, reasonably confident in our chain, for the night. Yesterday we returned home and this morning, we took the ferry to Nidri, returning with two much needed haircuts and a loin of pork! We also enquired about opening a Greek bank account (not as easy as it could be) and hiring a car or quad bike for the winter. Tomorrow we shall head out again and go wherever the wind is blowing, if there is any - the beauty of this area is that there's always somewhere nice to go, whether it's 2 miles or 20 miles away!